With regard to my last post, for anyone who watched the season of Survivor that just ended, think of Courtney. The "quintessential" bitchy New Yorker, yes? Well, she's a transplant. Born and raised in Boston. A good portion of the New York population is in need of an attitudinal adjustment*, in my opinion. At least in the area of walking etiquette. Walk down nearly any city street and you'll see people barging forward with no regard to who they might run into. They expect others to get out of their way. You pull in your elbow, adjust your bag so it's behind you, and make other courtesy moves like that. If the oncoming person did the same, you'd pass without incident. Instead, the person makes no move. They crash into you and don't bother to turn around, excuse themselves or apologize. Not even an apologetic glance. Groups of people walk 3 or 4 abreast without adjusting for crowds and force everyone in their path to dodge them. This is all, of course, amplified if you go up to midtown and brave the most crowded sidewalks in Manhattan. This is probably not news to most of you. New Yorkers have a reputation for being rude and thoughtless, especially when it comes to behavior when walking, driving or waiting in line for anything. I've not made any stunning revelations here. But here's the thing: I don't believe it is native New Yorkers who have earned the city this reputation. I think it is mostly transplants. With some exceptions on both sides, I'm sure. When you move to New York, whether or not you have spent time in the city before, you are moving into one of the most populated and most legendary and storied cities in the world. You start out with preconceived notions of what to expect and how to behave. For the native New Yorkers and long-time residents, this is their hometown. They treat it as such. They are comfortable and secure here, without trying to live up to expectations or make a certain impression. Having said that, it is important to note that being cautious and always aware of what is going on around you is essential. To be overly confident or unaware can invite trouble, as can being too friendly. I don't want to say that I take offense to people who are cautious and very guarded about themselves when out in public. I am that way to some extent, myself. It's self-protection and common sense. I am sick of the rudeness, though. *My parents used this phrase often in reference to me when I was a bitchy rotten growing, sensitive young teenager. Appropriate, don't you think? I am terrible about sending birthday cards. If I know you in real life, you can be pretty sure I have your birthday marked on my calendar. I may even have an alert that tells me when it's a week away. But you probably don't get a birthday card from me, unless you're in my immediate family. Or if you do, it's probably every two or three years. I am birthday-card-impaired. I am not sure why this is. I remember birthdays. On the day, I always think about the person. I wish them a happy birthday in my head. I wonder what they're doing and hope they're having fun celebrating. I will probably talk to M about it being my aunt/uncle/cousin/friend's birthday. I want the person to know I am thinking of them. Clearly, the logical way to do that would be to send a card. I want to send birthday cards. And yet, I don't. Why do I bring this up today? Well, yesterday was my cousin's birthday. She is not only my cousin, but also my good friend, and she's like a sister to me. And not only did she have a birthday, but she turned thirty! Also, I had 30 days notice this time -- go check out her 30 until 30 posts during the month of November, as she counted down to her thirtieth birthday. So, Maresi? I apologize sincerely for my birthday-card-impaired self. I have no excuses. I hope you had a wonderful day yesterday. Happy birthday! So, here we are at Thanksgiving already, and it appears I've been slacking. We've been quite busy. A good friend and former college roommate, A, came up from central Pennsylvania and spent the day two weekends ago. I took her into Manhattan, where she'd never been before, and we saw Rockefeller Center (the tree is up!) and Times Square. Mainly, though, we did a lot of catching up. It was wonderful to spend time with her. A couple days later, I had lunch with my good friend and another former college roommate, T, whose wedding, you may remember, we attended back in October. I hope we can make it a monthly lunch date, as she comes into the city once a month for a meeting. This past Sunday, M & I cooked a Thanksgiving meal for a few friends. We had fun and loved having good friends to share it with. M & I cooked & baked all day, ate and enjoyed ourselves, and when everyone left, we cleaned up the kitchen. About an hour into it, I suddenly realized how exhausted I was. I could barely keep my eyes open. I said goodnight to M, and I was sound asleep a few minutes later, by 9:30. I hadn't realized how tired I was! It was completely worth it, though. Now we're eating a fridge full of leftovers. Thursday morning we'll take an early train down to PA to see M's family and have another big Thanksgiving meal. It'll be good to see everyone there. Right now, my mom is on a plane with 2 of her sisters and their mom, on their way out to California to see their other sister. They're having their own vacation together, inspired by our cousins weekend. They'll spend Thanksgiving and come home on Saturday. I'm sure they'll have a great time and I can't wait to hear all about it. Speaking of our cousins weekend, we've got another one planned! This time, they're coming to me, the first weekend in January. It's going to be great fun and I'm really looking forward to it. As with last Thanksgiving, it is difficult this week to remember the things I have to be thankful for. It seems overpowered by the losses, and by what I don't have. I think of G, and how much I miss him. I think of M's nephew, N, our godson, who we lost two years ago this December. The last time we saw him was that Thanksgiving. I think of the beloved grandparents both M and I have lost over the last couple of years. For me, Thanksgiving brings all those cherished memories to the surface. It is difficult, but necessary, to remember to be thankful for those memories. Thankful for the time we did have with those loved ones. Thankful for each other and for the families and friends we have with us now. So, this Thanksgiving, I grieve for those we've lost. But I'm also very thankful for my husband, our families and our friends. I have some great memories of Halloween growing up. 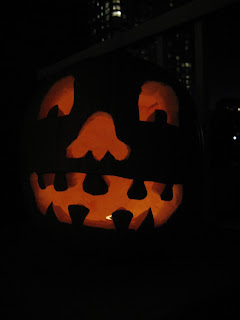 We always carved pumpkins and roasted the seeds. G and I were probably the most excited about it, but I'm sure we left the grunt work to mom & dad. Dad always had to do the carving, and because we were disgusted by the inside of the pumpkin, they always had to separate out the seeds. One year, we grew pumpkins in the garden. G and I set up a stand in our front yard to sell them. I think we priced them at 50 cents each. That sounds like a great idea, a good project for kids, right? But here's the thing - almost all of the pumpkins were green. They didn't quite ripen. Not only that, we grew up on a street that is a circle. It only has 9 houses, one of which is a summer cottage. Therefore, absolutely no traffic. None. So, secretly, Mom called the neighbors. She called our grandparents. She called other relatives. One by one, they all showed up to buy pumpkins. We were so excited to have customers! Every year for Halloween, G and I had homemade costumes, made by Mom. We were cheetahs, mice, witches, hobos (we were not always politically correct!) and many other things. We had the best costumes going. Several of my smaller cousins have since worn some of them, and it's fun to see them again. I think my favorite of all, though, was the year we were playing cards. We each had two large homemade cardboard playing cards, front and back. Nearly as big as we were. They were hooked together with rope or string, and set over our shoulders. We wore, if I recall correctly, red pants and turtlenecks underneath. They were great costumes. However, if you've been paying attention, you will remember that we had only 7 other possible houses at which to trick-or-treat on our street. Once you get off of our street, it is a busy road and not suitable for walking to trick-or-treat. So we always drove. Mom & Dad drove us around to all of our relatives' houses all over town. This means, at every house, it's out of the car, in the car, out of the car, in the car. Large cardboard costumes don't work so well for that... so every time, they came off. Get out of the car, put on your costume. Get candy. Take it off. Get out. Put on. Get candy. Take off. You get the point. Seriously time-consuming and cumbersome. But still my favorite costume memory. Those costumes were great fun. This year, we kept it a little simpler. We got just one pumpkin (I'm almost out of the toasted seeds already) and drew our own crude pattern. We must have thrown away our little pumpkin carving knife when we moved, so we used a kitchen knife. We like it, though. I made M do all the actual carving, but I did most of the seed-separating. And now, I am helping to uphold the trick-or-treating tradition for all the kids in our building. So far, we've had dinosaurs, gangsters, pumpkins, Lightning McQueen, princesses, Tinkerbell, Dora the Explorer, Darth Vader, a ladybug and quite a few other adorable kiddos in costumes. M just got home from work, so if we're lucky, we'll get at least a few more groups of kids so he can share in the festivities, too. There's the door. Happy Halloween! The Indians defeated the Yankees 6-4 in last night's game. Be sure to tune in Friday evening to watch the Red Sox beat the Indians. It should shape up to be a good series, as both teams are hot and have been doing extremely well. Josh Beckett will be pitching Friday night, and he's been pitching great games. I'll be cheering for the Red Sox to make it to the World Series. On Saturday, my good friend and former college roommate, T, got married to a great guy. By complete coincidence, she and I were engaged on the same night - Christmas Eve 2005 (well, technically, very early Christmas morning in my case). We enjoyed talking about our weddings as we planned them. She was very supportive to me in the couple of months before my wedding, always there if I needed to vent. I hope I was as supportive to her. In August, she asked if I would play in her wedding - Trumpet Voluntary, as the processional. I was very excited to accept. My degree is a BA in music (concentration in trumpet performance and composition), and I don't perform in public nearly as often as I'd like to anymore. I took the train out Friday afternoon for the rehearsal and rehearsal dinner, and had a wonderful time meeting T's and her husband, M's, families and some friends I didn't know before. My M took the train out late Friday night after he got out of work and met me at the hotel. Saturday afternoon and evening was the wedding. It was a fabulous wedding, T was just beautiful and they both looked so happy. There was an enormous amount of food, both at cocktail hour and during the reception - I suppose that's all the Italian in both of them! Quite a few of our good friends from college were there, at our table, and it was great to get to spend time with them. Most of them were at my wedding a few months ago, but I didn't have much time to spend with them then. All of us drank way too much, laughed all night and generally had a wonderful time. I miss them very much and hope that we can come up with more reasons to get together much more often (hint, hint, A&P and A&C)!! On Sunday morning, we met for brunch, along with T&M and their families, in the hotel restaurant. Shortly after, everyone said goodbye and headed home. I am still tired today, but it was completely worth it. "funny sayings paying last child support payment"
I just thought I'd share. Didn't want to be the only one wondering what on earth this person was thinking. That's all. As you may have noticed, I have been absent from my blog for a little while. I've been very busy! Last Sunday, my mom arrived into Port Authority on the bus, to spend the week with M and me. She took a week-long seminar in midtown and stayed with us. While pesky things like work and seminars got in the way during the day, we really enjoyed spending time together in the evenings. She learned the subway system, and even commuted back to our apartment by herself 3 nights, including switching trains. Mom and I went shopping in Herald Square, and we went to the top of 30 Rockefeller Center, to see all of Manhattan and out into the boroughs and New Jersey, including a magnificent view of Central Park. We poked around some shops, including a sheet music store with lots and lots of piano music. She and M and I enjoyed a lovely dinner at Bobby Van's Steakhouse. We had a wonderful week. On Friday, my dad arrived for the weekend. Friday night, the four of us went to dinner at a small trattoria in the theater district, and then to see Spamalot. I highly recommend it! It is very funny, and they did a great job of adapting Monthy Python and the Holy Grail to stage. If you think that sounds like a fabulous week, you're right! But it doesn't end there. On Saturday morning, M's parents, his sister, and her husband arrived. All eight of us went to Yankee Stadium so everyone could see the stadium before they tear it down after next season. And more importantly, to watch the Yankees lose (well, except for M and his brother-in-law, rooting for the Yankees)... unfortunately, it didn't quite happen that way. First up was the rain delay, postponing the game from 1:05pm to a little after 2:30pm. Fortunately, we were in the nosebleed seats, with a roof over our heads. When the game finally started, it was quite slow. An hour and a half into the game, it was still in the third inning. Around 5:30, when our 8:00pm dinner reservation was looking threatened, and the game hadn't gotten any more exciting, with the score 3-2 Yankees, we opted to leave early. Upon our arrival back to Jersey City, we discovered that the game was now tied 11-11 in the 7th inning! Apparently, we left at the wrong time. In the end, the Yankees won 12-11. However, in happier news, the Red Sox won that day and are now guaranteed the playoffs! The group of us then had a lovely dinner at South City Grill, where we all overate and generally enjoyed ourselves. Everyone headed home yesterday, and we were sorry to see them go. As much as we love living here, it is hard to be far away from family. We are so thankful when they come and spend time with us here. As you all know, yesterday was the sixth anniversary of the world trade center, pentagon, and flight 93 terror attacks. From what I noticed on the train, around my office and in the neighborhood of my office building, the general mood was quieter than usual, more tentative. The trains were as full as usual, but the people were more subdued. Personally, I reflected on the attacks and the tragedy, observed the moments of silence throughout the morning, and I was very aware of the cloud of sadness and remembrance hanging over New York City. Above all that, though, I felt like an intruder. I wasn't living here in September 2001. I was still safely tucked away in a small and quiet college town in central Pennsylvania. Like the rest of my generation, I imagine, I will never forget that day and what I was doing when I heard about the attacks. I won't ever forget that nearly every class on campus was canceled, but my woodwinds professor insisted on having class - from 2 - 3:15 - on that Tuesday. At the time, I thought it was ridiculous. Now? I realize she was trying to keep life going. To distract us and to prove, in this small way, that we would not be shaken or defeated. But most of the day was spent gathered in M's suite with his roommates, my roommate and other friends. We talked, watched the news and distracted each other. We waited to hear from a friend's brother who was living in NYC, to find out of he was okay (he was, and is). It was a long day, but a very memorable one. Last year, we had been here less than three weeks. I wasn't working yet and M & I went to some concerts and remembrance events happening around the city. I was very moved and very interested. I felt as though I was attending a ceremony, as though I was an outside observer. Now, I've lived and worked in New York for just over a year and this is my second September 11th spent here. This year, I feel a part of this city. I feel connected to it. But no matter how long I'm here, no matter how many more September 11ths I spend here, I will always be an intruder. I will never understand the deep tragedy, the spirit of helping everyone around you through the day and the following weeks and months. I will never understand the strong bonds and the togetherness that rose out of that horrific tragedy, the loss felt so deeply by an entire city at once. Yes, I have my own strong September 11th memories and experiences. But they don't quite fit in here. I can, and will, continue to remember the lost lives, honor the heroes, and reflect on each anniversary. I will do it quietly and personally, though, out of respect for those who were here that day. The true survivors and the true heroes. I would like to thank everyone who commented on my last post. And I would like to apologize for not having acknowledged any of your responses in any way until now. Truthfully, I was a bit overwhelmed and unsure how to respond. I live with the reality of G's loss every single day. It has become a part of me, and seems almost 'normal' - if anything can be called normal - to be feeling the loss all the time. Most people around me in my daily life know nothing of my loss. Even those at my office who know my brother died don't know the circumstances. They don't know how close we were. They have no idea who he was, or in most cases, even his name. What I'm trying to say is that the comments filled with care and love, the knowledge that others also live with their own small but almost obscene reminders of loss, is comforting to me. Please don't misunderstand and think that I want anyone else to feel the horrifying pain of loss. It's just that I live with it every day and have learned to function outwardly in a world that expects me to be "over it" by now. To know that you share even a small amount of that pain and understanding is to know that I am not alone. Often, when I'm walking around New York, I come across something I want to share with my brother, G. He would have loved spending time with us here. There are so many things we'd have done here together. I would have taken him to Small's, the legendary jazz club. I would have taken him to Joe's and John's, the two best pizza places - and I guarantee he'd have argued with me over which was better. He would have loved to ride the Cyclone with me in Coney Island. It is often some sort of cultural thing like that I wish I could share with him. But it's just as likely to be something much less noticable. For instance, the vintage t-shirt shop I passed in the West Village a few weeks ago. G loved t-shirts. Classic rock band t-shirts leftover from the 70s or 80s. Funny sayings or logos. Souvenirs from various locations, from trips or activities. He loved them. I would have hit the jackpot for him in there. I couldn't bring myself to face what could have been. I couldn't face all the people casually shopping, laughing, enjoying themselves. It would have been too lonely, too isolating. Occasionally, in this city of eight million, I feel completely alone. My aunt requested in the comments of my last post to hear about my evening at the Rainbow Room. M and I had the opportunity to go a few weeks ago for a dinner & dancing event; it was an end-of-summer party organized by M's employer. The view was amazing from up there on top of Rockefeller Center. The buffet food, including dessert, was delicious. There was a talented jazz ensemble. I wore a fancy cocktail dress and M wore a suit. We ate and drank and chatted with M's co-workers. We did not dance. The two or three couples on the dance floor were extremely talented and nobody else seemed willing to join in; we didn't either. I enjoyed myself, though, and it's nice to be able to say I've been to the Rainbow Room! One year ago this week, M and I moved out of the spacious two bedroom apartment and the area we had grown to love in Bryn Mawr, Pennsylvania (just outside Philadelphia). We moved into our tiny studio apartment in Greenwich Village, leaving most of our belongings with family in Connecticut. We sold our cars and committed to making the most of the city and its public transportation. We took a leap of faith, and we jumped in with both feet. M started his year of school and I eventually found a job. We immersed ourselves in the culture and took full advantage of the opportunities available to us. Less than nine months later, it was time to move again. We had to move out of our student housing and find an apartment. Due to the unbearable rent costs in Manhattan, we made the difficult decision to move across the river to New Jersey. We found an apartment right on the river in Jersey City, slightly more affordable and with significantly more space than we could have gotten in Manhattan. We have a one bedroom apartment and have most of our belongings back. M and I both work in Manhattan, and we take the train in every day. So far, I think we made the right decision. I would be lying if I said I didn't miss the Village. I adored our neighborhood and the unbelievable array of restaurants, shops, parks and cultural opportunities literally at our doorstep. But we have lived in Jersey City for more than three months now, and we are still taking advantage of the opportunities in Manhattan and the rest of New York City. It would be easy to take this city for granted. It would be easy to take any place for granted, if you live and work in it. I hope I never get to that point. One year into it, I still love this city. I am drawn to it and I want to experience everything. Today, if you asked me how my day was, the answer wouldn't be positive. I would probably use words like annoyed, frustrated, mad. It's not because I had too much to do at work, or because I'm tired, or I want to go home already (all the usual suspects), and it's not even because it's pouring rain and I've been wet and cold all day. No, none of those things. Let me explain. This morning, when I arrived at work, I placed my lunch, leftover pasta and a can of Coke, in one of the two communal refrigerators. At 1:00 when I went to retrieve my lunch and heat up the pasta, the can of Coke was missing. Gone. Stolen. Someone took my soda and drank it. To be honest, I feel violated. Not only that, but the soda machine is broken, so I couldn't even buy a replacement can of soda. And I was in the middle of something with no time to leave the office to get one. So I ate my lunch without it. Meanwhile, some thief, somewhere in this office, was drinking my Coke. I hope it tasted bitter with regret and remorse. That's Astroland. It's a neat old amusement park, and we enjoyed seeing it. The only ride we went on was the Cyclone, which is not actually inside Astroland. The Coney Island Cyclone is a famed old wooden roller coaster. It's a great roller coaster, but it is definitely that old brand of rickety wooden coaster! Your eyes do not deceive you. This is an empty lot right off the boardwalk, decked out with graffiti and looking like a war zone. Note the sign at the back of the lot - "Shoot the Freak. Live Human Target." There is a young guy - assumedly, the "Freak" - right in the middle. You can pay $3 per 5 shots and shoot paintballs at him. Don't let anyone tell you carnie culture is dead. But we did not eat any Nathan's hot dogs. This may be anti-New York, but I happen to think anyone spending money on a Nathan's hot dog is wasting their money. I ate one once and was not impressed. I'm pretty sure I wouldn't even eat one if it was free. Coney Island is a fun place to see, especially on a beautiful day like yesterday. I recommend you go check it out, if you can. Last night, M took me to dinner for my birthday. We went to Bar Americain, which is one of Bobby Flay's three restaurants in New York. We had just finished our starters when Bobby Flay himself walked through the door into the restaurant. He went into the kitchen and was talking to the chefs, and then greeted a few people at tables in the restaurant. There was a Tennessee congressman in the restaurant, according to the host, and he spent a little time at that table. We watched him working around the kitchen (it's an open kitchen) throughout dinner. The food was amazing, we had good wine, and shared caramel whiskey eclairs for dessert - fabulous. It was very enjoyable, and an added bonus to watch Bobby Flay in action. My guess is that he goes to a different one of his restaurants each night when he's in New York. I asked M to tell him it was my birthday and ask him to come wish me a happy birthday. Not surprisingly, he wasn't up for that! I guess I can't blame him. However, after we finished eating, the host said he was very approachable when he was in the kitchen. I went over and introduced myself and told him how much we enjoyed his restaurant. He was friendly and thanked me. All in all, a great experience and a fun way to spend my birthday! It took me over an hour to get to work today. My commute is normally 25 minutes. Apparently there were some terrible thunderstorms with torrential downpours early this morning. I slept right through it all, and was very surprised to arrive at the train station and discover that the tracks were flooded and trains were running 10 to 15 minutes apart, instead of the usual 5 minutes. As a result, the platforms were mobbed, and my husband, M, and I figured we'd never get on a train. We re-routed ourselves out of the way (took a different train to another stop) and eventually got into Manhattan, after some terrible crowding. I am gross, sweaty and annoyed. When we finally got on a Manhattan-bound train, we smashed ourselves in with the 1,987,000 other people cramming into this particular train car. Once securely wedged in, the train began to crawl slowly toward Manhattan. Immediately next to me was a girl curling her eyelashes and putting on mascara. She had a teeny little mirror out, with her eyelash curler, and was balancing against the door. She took the curler, applied it to her lashes, and clicked it a few times against them. Took it away, poked at her lashes with her finger, and repeat. Then again. and again. M started counting the number of times she did this. We were partway through the cycle on her first eye when we got on the train, but caught the entire cycle on her other eye. She repeated this little curl, poke, repeat TWENTY-SIX times. On one eye. Click, click, click, poke, poke, poke, repeat. Twenty-six times. I wanted to slap her. Then she applied liberal doses of mascara to each eye, so much so that it bled through onto her eyelid, which ended up covered in black mascara. In the end, she looked much worse than when she started. I eventually got off the train into the extreme heat and humidity and made it to work. Forty minutes and a second packed train after me, M made it to his job. We found out after arriving that they've now canceled most train service around Manhattan. I wonder if they'll get it together by the time I have to turn around and make my way home. Let's hope. I had a fabulous, hilarious, relaxing, precious, bonding weekend with my cousins. My only complaint is that it was too short. I miss them all already. Every time I see them, I realize how much I truly miss them. I can't wait until we all get together again! Family is so important. If the painful loss of my brother, my grandmother and my nephew over the last year and a half has taught me anything, it is that family is everything. I'm extra lucky though, because all but less than a handful of my best friends and closest people are family. They're people I would choose to be with even if I weren't related to them. It makes it extra easy to put family first when they are such fun, caring, wonderful people. In about an hour, I am leaving for a mini-vacation. A long weekend in Florida with three of my favorite people. It will be full of sun, relaxation and much hilarity and bonding time with my cousins. I can't wait! So, this blog is an experiment for me. I don't know if I'm going to enjoy writing it or if I'll keep up with it, but I am curious to find out. I have been quite the blog lurker lately, I read a lot of blogs. I thought, if so many people are doing it, there must be something to it. And here I am. I am not yet certain of the direction I'll take on this blog, although the title may give the opposite impression. But "not an only child" is a big part of who I am. I feel that so many other parts of who I am are out there, for anyone to see. But that piece of me is hiding. Unless you know me well, you can't see it. So here, on this blog, I'm putting it out there, front and center. I am not advertising this blog to friends, family, or anyone else. I'm not hiding it, either. I think I'll just let it be and see what comes of it. See if I can get the hang of this blogging thing. I am not an only child. And yet, I have no siblings. Or I guess I should say, I have no living siblings. You see, my little brother, my closest friend, the person who really knew me my whole life, is dead. He died 15 months ago. I miss him terribly, and the grief still occasionally threatens to swallow me whole. And yet, I have positive things in my life. I have parents who love me, and who are fighting through their grief, just like I am, and I love them dearly. I have cousins, and aunts and uncles who love me and whom I love and treasure. And best of all, I have a wonderful new husband. So I will make it. One day at a time, one foot in front of the other. That's all anybody can ask.